University of Hong Kong had just hosting a talk about the Early childhood development and air pollution on 26th November. If you are interested in the content, please download the pdf file attached. Bus companies should be subsidised to buy vehicles that are better for the environment, according to a research paper released yesterday by private think tank Civic Exchange. The 26-page paper, “Paying for a Cleaner Bus Fleet”, also calls for environmental performance to be introduced as one of the criteria when the government assesses whether to award a franchise to a bus operator. Hong Kong is one of the few big cities in the world where there is no publicly owned bus service. Five private firms operate 5,768 buses on 700 routes. As they aim to maximise profits, the paper says, “the easiest and most effective way is to prolong the life of their existing vehicles, even if these vehicles are harming public health”. The paper cites Singapore as an example and says that 860 of the 4,353 public buses there are fitted with engine classes of Euro IV or above. Some 2,100 Euro I buses are expected to be replaced by 2011. But in Hong Kong, 53 buses, or 0.92 per cent of the fleet, are Euro IV. And 456 pre-Euro buses will not be retired until 2012, while 1,338 Euro I buses will only be replaced in 2015. Civic Exchange chief executive Christine Loh Kung-wai said: “The latest standard is Euro V, while other cities are already using hybrids, electric trolleybuses, and even compressed natural gas and hydrogen. The government has proposed making vehicles more environmentally friendly by requiring fuel supplied in the city to meet greener standards. Government proposals in a Legislative Council paper that lawmakers will discuss on Monday include a move to the Euro V emission standard, introduced in the European Union for heavy diesel-powered vehicles last year, and Euro 5, which will apply in the EU for cars, vans and light trucks from next year. 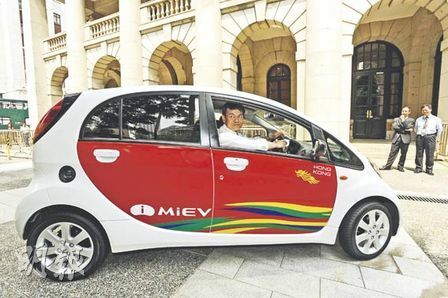 Currently, Hong Kong’s highest requirement for vehicles is Euro IV/4, though the paper said that diesel supplied in fuel stations in the city already met Euro V.
“If existing petrol vehicles use Euro 5 petrol, their emissions of carbon monoxide, nitrogen oxides and hydrocarbons will be reduced by about 10 per cent,” the paper said. Oil companies said it was difficult to predict the price of Euro 5 petrol. Some estimated it would sell at less than 20 HK cents per litre more than Euro 4, which now cost about HK$12-13 a litre, according to the paper. The government stated in the paper that it was still reviewing whether it would adopt the higher standard for vehicles. “As the Japanese vehicle manufacturers require more time to produce Euro [V/5] compliant vehicles for the Hong Kong market, we are not yet ready to implement the Euro [V/5] vehicle emission standard,” the paper stated. Most heavy duty commercial vehicles in Hong Kong were imported from Japan, it stated. Democratic Party lawmaker Andrew Cheng Kar-foo, deputy chairman of the Legco transport panel, welcomed the proposal. When Paul Tse Wai-chun, the Legislative Council representative for tourism, was asked about the effect of recent record street-level pollution on tourism, he responded that the government was doing its best to remedy the situation. Really? When we can no longer take our tourists to Mong Kok to visit the street markets, because the pollution levels are so high there, we have to question what the administration is doing. Very little, judging by the ever-present PCCW, Hutchison 3G and CSL promotion minibuses that are parked on the streets of Mong Kok, hogging drop-off points and forcing other vehicles to double park and block the traffic. At metered facilities, vehicles covered in promotional banners are parked there for no reason other than to provide a low-cost but highly visible advertising medium. This is despite the fact that commercial activities are prohibited at parking meters. Some of this activity, and the accompanying illegal parking, is taking place within sight of Mong Kok police station. Where are the traffic wardens and patrolling officers who should be on the streets, writing tickets and getting the traffic moving? Last week, while enjoying the serenity of Kowloon Park, I was asked to move out of the way to allow some government cars to drive by. What were these cars doing inside a public park, particularly when there is an MTR station close by? It is high time that the car park beside Legco was closed down and Legco members and government officials forced to walk on the streets with the majority of the population. We expect our Legco members to battle for the right of tourists and locals to clean air, not to recycle the feeble excuses that the Environmental Protection Department trots out about pollution coming from across the border. It is being generated right here on our streets, under our noses. Take action, Mr Tse.